Shopping for Knight Rider Vehicles? Limited edition KITT car vehicle! Based on the Knight Rider TV series. 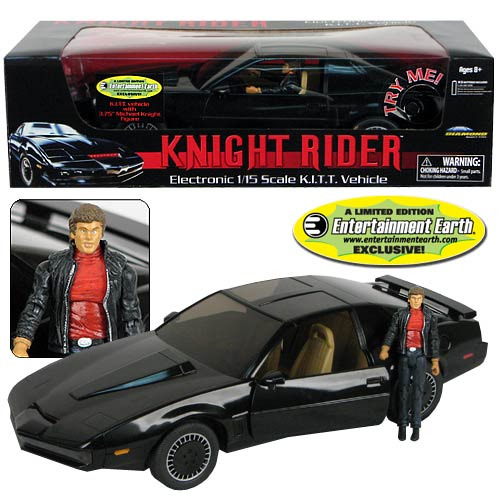 Includes an exclusive Michael Knight Action Figure you won't find anywhere else! Electronic lights and sounds. Doors swing open. Figure fits inside vehicle. This is the best toy KITT money can buy! Features voice of KITT - William Daniels! Entertainment Earth Exclusive! The Hoff is back! Based on the 1982 TV series Knight Rider, this is the best toy KITT money can buy. Not only does it feature spinning wheels and opening doors, it has lights and sounds, too. The lights pulsate with 5 LEDs in the front sensor bar! But wait, there's more! It's a limited edition, roughly 13-inch long vehicle based on a 1982 Pontiac Trans-Am that's compatible with many 3 3/4-inch scale action figures. And we included one! Get your very own 3 3/4-inch David Hasslehoff as Michael Knight Action Figure... available only in this set! The Knight Industries Two Thousand (KITT) is here to save the day, and this exclusive set brings two of the 1980s' most beloved television icons together again!